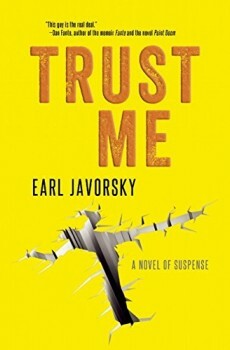 Earl Javorsky’s psychological thriller TRUST ME comes on the heels of his truly strange noir detective novel, Down Solo. Although the two books are entirely different in style, they share a common theme: addiction and recovery. As a self-identified member of what he labels “an abstraction called the recovery community,” Javorsky knows the environment and digs deep into a trove of harrowing, sometimes absurd, events from his own experience. TRUST ME is an ensemble piece centered around two lost souls: Jeffrey Fenner, an alcoholic drug dealer who finds out that his sister has committed suicide, and Holly Barnes, whose past abuse has brought her to a self-help group with a charismatic leader. Jeff, who has hit bottom but doesn’t know it yet, doesn’t believe his sister would take her own life, and his relentless pursuit of the truth leads him to some unlikely allies, jail, and the same group Holly attends. When their paths converge, Jeff discovers that Holly might be the next target of a serial killer. Your lead character is not easy to sympathize with. Why should readers care about someone they don’t like? Ha! Great question. Jeff is a selfish, clueless loser with few redeeming qualities. One of my favorite tricks in literature and film is when a character turns my sympathies upside down—think Al Swearinger in Deadwood. The hard part is engaging the reader long enough to become interested in an individual’s evolution. Is there a factual basis for any of the events in TRUST ME? Yes and no. There was a guy up in LA (I’m in San Diego now) who seduced women inappropriately—he was in his late 60s and liked them in their 20s. Hypnosis was in his arsenal, but his real power was in his congenial mentor act: he would take them under his wing and help them out. He was actually a nice guy, but it was creepy. The opening scene at Lilah’s apartment may or may not have happened pretty much as described. And Holly’s history of seizures and her subsequent diagnoses and problems with prescription medicine are borrowed from a dear friend’s personal history (she just finished the book and loved it). How about the previous book, Down Solo? Down Solo is entirely a product of my imagination. I’m fascinated with all things having to do with addiction and recovery, including alternative modalities like ibogaine treatment. I like a story where you have a fairly regular guy who has tripped off the middle-class path into a dangerous world he’s not prepared for and has to improvise to survive. I’m also interested in the precious metals market, and have watched the scam artists—believe me, they are legion—come and go. And finally, I’m intrigued by the mind/body conundrum and the possibility that they occupy separate domains in objective reality. Mix these all together and you get a peculiar, noirish novel with a supernatural angle, but more Raymond Chandler than Steven King. I started out an English major. I wanted to be a journalist, and landed a few gigs with entertainment magazines. At one point I even got a gig with Rolling Stone Magazine, which lasted about a minute. Then I got sidetracked and gave music my best shot. My next incarnation was as family guy and software rep, but I got mentored by a couple of great teachers, including Tom Filer at UCLA, and eventually got back to serious writing. My “day gig” includes writing web content for treatment centers, as well as doing editing and proofreading for a couple of publishers. Was it hard getting a publishing deal? Terrible. Hopeless. An ordeal out of a Cormac McCarthy novel. Okay, that’s a bit of a hyperbole. I shopped TRUST ME for years. One time a big New York agent read it all the way through and told me it needed work but that he would read it again. I did the work and resubmitted, filled with grandiose ideas. I could already see my name in the screen credits. Of course, it got rejected. I finally said the hell with it. Then, on a whim—well, on the strange inspiration for a first page—I wrote Down Solo and started the whole submission process again, with the same results. My path to publication was kind of a back-door deal. I was listening to NPR on my way to the beach and heard a guy named Lou Aronica, who has a great track record in the industry, talk about his new publishing company, The Story Plant. I made a note of his name and found a way to reach him. In my cover letter, I pitched both books, adding that I could promise clean manuscripts, as I was also a proofreader and copy editor. Lou said he didn’t take unsolicited material, but that he could use a proofreader. I got to work on a lot of great projects with Lou before (and since) he finally asked for a look at my own work and agreed to publish it. So for the aspiring writer, self-publish? Or hold out for a deal? Well, I can’t make that call for anyone. I’m old-school enough to have been put off by the idea of self-publishing. One of my best author endorsements came about after I went to a library reading by a well-know writer. I bought his book and got him to sign it and then told him I had an ulterior motive: to get him to read my book. His first question was: “Is it self-published?” When I said “No,” he grinned, shook my hand, and said, “I’d be delighted to read your book.” On the other hand, I know you can have a contract with one of the big houses and still be an orphan, with little support or promotion. We’re a few years behind the music industry, and indie and self-publishing are gaining legitimacy, if not marketing muscle. The problem for the reader/consumer, of course, is the sheer volume of new stuff being published. Who’s going to filter it for them? Thanks for giving me some space here. I’m truly pleased to be a part of The Big Thrill. Earl Javorsky’s first novel, DOWN SOLO, was released in December, 2014. After a long stint trying to make it as a musician in LA and clawing his way up to mid-level management in the chemical entertainment industry, he went back to his first love—writing. He had the good fortune to run into Lou Aronica, his editor at The Story Plant. He works as a proofreader/editor. To learn more about Earl, please visit his website.